Solomon Boscov founded his first department store in 1914. Reading, Pennsylvania was the home of the first store, although it was called the Economy Shoe Store and Dry Goods Annex instead of Boscov's at that time. When you spend $100 or more, use this Boscov's promo code to save 15% on your order. Exclusions: Select rain boots, Beauty, Bras, Toys, Small Appliances, Vacuums, Coffee, Tea, Home Climate, Electronics & Tech Accessories, Personal Care, Patio, Pools, Grills, Furniture, Mattresses, Gift Cards, Citizen Watches, Columbia, Destination Maternity, Dolfin Swimwear, Koolaburra by Uggs, Nike, Ladies Rampage Shoes & Boots, Vionic, Special Orders, Daily Deals & Flash Sales, Best Value, Incredible Doorbusters, Restaurants, Catering, Optical Center, Hair Center, Hearing Aids. Online only! Shop thousands of items site wide, including NEW spring arrivals and winter clearance. Must spend $100 or more for this discount. Happy Savings! Details: Holiday! Get At Least 50% Off Ticketed Price + Free Standard Shipping on orders over $25. Details: Beat The Rush! Get 25-75% off Clothing, Boots, Winter Coats, Holiday decor & More. Details: Curtains & Tiers Event! Buy One, Get One 50% Off Select Styles. Currently, they have close to 40 stores all through the Mid-Atlantic. They cover ground from New York, Ohio, Pennsylvania, New Jersey, and Delaware. If you don't happen to live near one of their offline stores, then you can always shop online at boscovs.com. Here customers can make great savings by redeeming our online Boscovs coupons. You can also make savings offline by using Boscov's printable coupons in one of their retail locations. Visitors to the website can sign up for the Boscov's credit card. This will concurrently enroll them in the rewards program, and you'll earn points every time you shop using the card. Special benefits change based on what level you've reached. A good way to stay updated on what special offers the brand is promoting is by signing up for the official newsletter. You can also find them active on networks such as Instagram, Facebook, Pinterest, and Twitter. Boscov's offers a wide range of merchandise for ladies including dresses, suits, sweaters, and handbags. There is also a plus size section for those who need slightly bigger apparel. There is also a men's section on the website where they'll find shirts, pants, robes, and other items. Much like the plus-size section for women, men have a big and tall section for those who need bigger clothes. Shoes are also available for sale for both men and women. Different types are available such as boots, athletic, flats, pumps, sandals, slippers, and boat shoes. Accessories like sunglasses, backpacks, luggage, and wallets can also be found. Another major category on the website houses jewelry such as fashion and fine jewelry. It's made of various materials such as sterling silver, gold, gemstones, and pearl. There is also a variety of watches available for both sexes. The beauty category is another place that customers wishing to look their best should take the time to visit. This category has all of the major beauty brands that you would expect such as Clinique, Estee Lauder, Elizabeth Arden, and Clarisonic. Customers can also find a huge selection of toys on the Boscov's website. Some of the types include arts & crafts, building sets, education and science toys, games and puzzles, and dress up toys. You can also find riding and outdoor toys as well as various remote-controlled vehicles. Using Boscov's coupons for free shipping will lighten the load on your wallet while keeping your child happy. If you're interested in shopping by brand for other merchandise, then you can do that as well. You'll find some of the most popular including KitchenAid, Dockers, Calvin Klein, and Chaps. All major credit cards can be used to pay for purchases at Boscovs.com. The credit card issued by the company can obviously be used as well. Paypal is the only other method of payment, but their Bill Me Later program isn't an option. You can't use wire transfers, Amazon Payments, or Google Checkout. 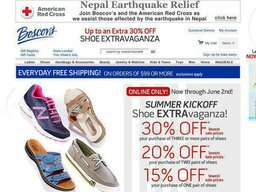 To redeem a Boscovs coupon code all you have to do is enter it in to the designated box during online checkout. Any Boscov's in store coupon must obviously have to be handed to a cashier at an outlet. By shopping online, you can get your items shipped to you for free based on certain conditions. You'll either have to spend $49 or $99 depending on which category you're shopping in. This free shipping offer only applies to orders sent to the 48 continental states. Deliveries to APO, FPO, or P.O. Boxes aren't made. From time to time you can also use a Boscovs coupon for free shipping, which will be sent via the Standard option. Make sure that you keep your original packing slip since you'll need it if you want to request a return. Requests must be sent to the company within three months of purchase. You can mail whatever you bought back to the company, or you can return it to a store if you live close enough to one.